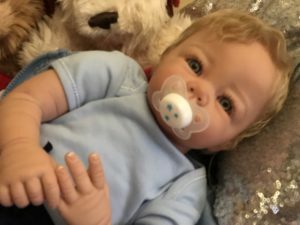 This sweet reborn baby boy is currently for sale on ebay. I am not the reborn artist for this baby. PLEASE READ ALL DETAILS OF THIS AUCTION! HAIR COLOUR BLONDE EYE COLOUR BLUE TAKE A LOOK AT MY LISTED AUCTION PICTURES! LIMBS ARE 3/4 ,THE DOE SUEDE BODY FULLY JOINTED TOP RANGE QUALITY. MY WEIGHT IS UP TO 6 LBS. D EFFECT SKIN COLOURING FOR REALISM.HIS NAILS ARE TIPPED AND SEALED HIS EYELASHES ARE HAND APPLIED LASHES. HAND ROOTED 42 NEEDLE ONE HAIR AT TIME, GLUED INSIDE HEAD TO SECURE SO YOU CAN STYLE GENTLY. EYEBROWS ARE HAND PAINTED ONE STROKE AT A TIME. 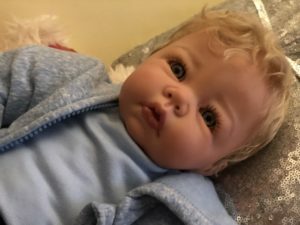 THIS IS AN ART DOLL INTERPRETATION OF A BABY BASED ON 0-6 MONTHS WHO CAN SUPPORT HIS/HER HEAD. NO SAND IN THE MAKING OF THIS BABY! PLEASE LOOK AT ALL PICTURES CAREFULLY BEFORE! HI MY NAME IS SANDRA, AND I STARTED OFF AS A MAKEUP ARTIST WHEN I HAPPENED UPON THIS WONDERFUL WORLD OF REBORNING ALMOST 14 YEARS AGO NOW, AND HAVEN’T STOPPED SINCE. I TRULY LOVE WHAT I DO CREATING WITH ART THESE BEAUTIFUL BABIES FOR DISCERNING COLLECTORS!